… a beach. This beach is long and stretches all the way into the horizon. It’s wide and deserted. It’s not a bay but an open coastline, so waves come crashing at their own good times, there really is no way you can get away from the powerful sound of the waters here. The other side of the wide sandy beach line is framed with the green, fresh and pine. Green hills slightly clouded by a bluish mist are on that other part of the horizon, facing the azure of the ocean. There’s an occasional couple or a family to be seen here and there, as well as those seeking their solitude. It’s not hot, you actually have to be wearing jeans, jacket and sneakers to feel comfortable, though the sun is really bright and you wish you had your sunglasses on. It’s breezy enough but somehow there’s no disturbing feeling about it. The beach is in a city, so you can easily imagine it crowded at the weekends. Now it’s weekday daytime. Perfect time for a stroll. This is what I’m seeing right now. This is what I’m experiencing. This might actually be My Perfect Beach. And I’m thinking of finally writing down and getting out what I’ve had imprinted in the back of my mind for 20 years, what I’ve told at least 4 people here in Korea about, something that has now gained enough strength to show up from the deep corners and is not afraid to grow. This not-so-secret “something” is about the beach. I don’t see how I could possibly write anything other than ultimately personal from a place like this. I see myself coming to such quiet beach on my own, sitting down facing the water, which would be coming as close as only 3 meters from reaching my feet in its mighty tidal wave. I cannot picture myself writing down pretentious lines from this place. I can, though, imagine I would yield to letting go of barriers that keep my mind (and language, as a consequence) think in terms of limits. I can imagine I would write my heart out, because it’s being called out from a source more demanding an honest answer than that of a promise to myself, a resolution “to write”, or a blog post title and notes in drafts. So I used to think I can’t write from anywhere else rather than my desk in Moscow, at any time other than comfortable, safe and lonely nighttime. 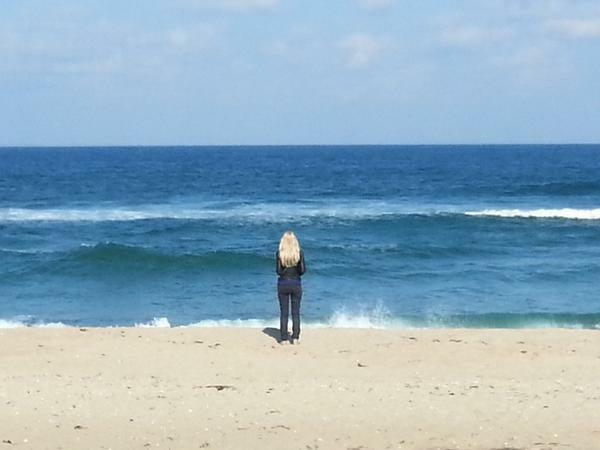 Apparently I’ve been proven wrong, by this beach, this day, and this ocean, as this post is just writing itself. This place makes me think of other things, too. It makes me think of just how many beaches I haven’t seen, and how few (and awful as in touristy) those I have seen are. It makes me think again of how lucky I am to have found out I enjoy being on my own (and that I can bravely enough openly state it here). It makes me think it’s relatively easy to live with no strings attached, or to cut those strings, in order to indulge yourself in what it is your soul is asking for. Or at least to go looking for it. My perfect walk on a beach is a walk I make on my own, all the way along, stopping where I want to, staring at the sand, seashells, masses of water that I’m actually so scared of. This walk gives me a chance to stare into those parts of my Self, which so easily get neglected and underrated in the busy city routine. I am thinking of a beach and what my life would be like in a place like that. I’m thinking of a change to make. I’m grateful to Anne Hendler for several things: (1) for letting me spend the whole day with her and her students; (2) for the sweet tangerines; (3) for the attitude towards students I have yet to learn; (4) for showing me the wonderful, special beach and in this way helping me (maybe unknowingly) find the right mood and enough courage to write this blog post. It is as different as my writing could ever get in this space. It is as personal as I can possibly make it. 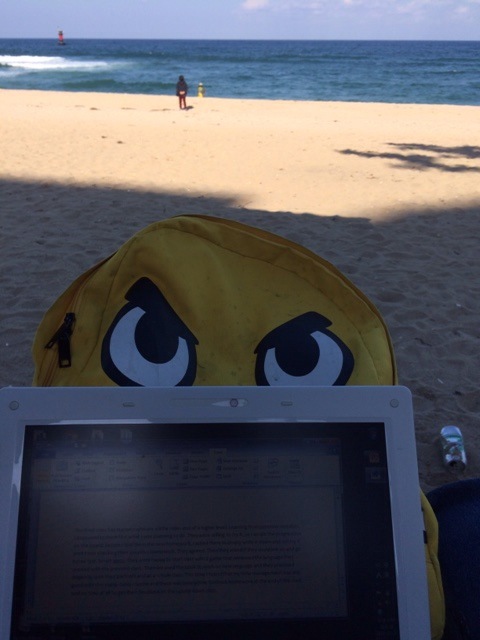 It is quite scary to hit “publish” right now, several hours after writing it from that rocking bench on that fantastic beach in Gangneung, too. But long live #livebloggingparty 🙂 I can hit “publish” now as I’m not alone. Thank you for reading. Here you can read Anne’s post written on that beach. 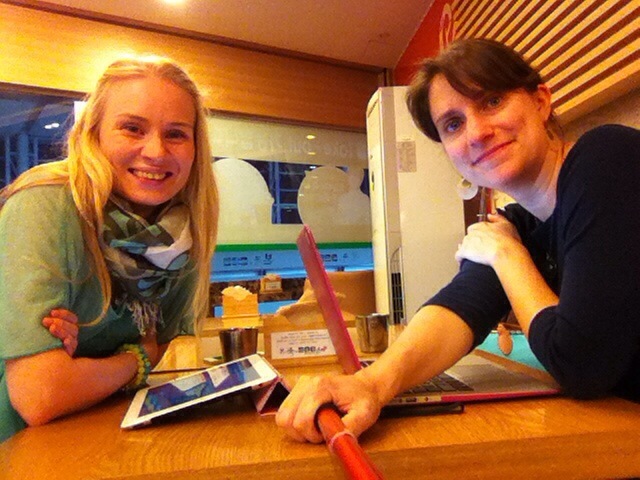 My unique Daegu time: with @JosetteLB and 16 Korean teachers. 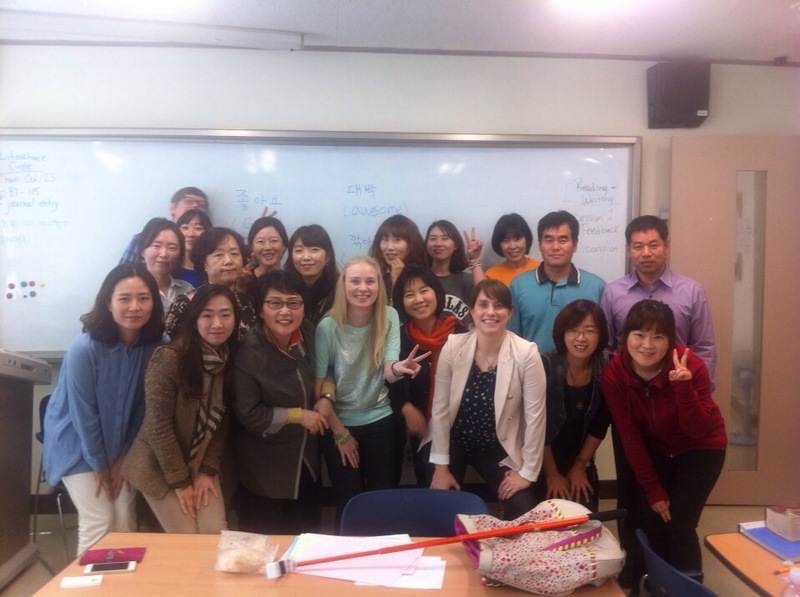 On Friday October 17th I visited Josette LeBlanc‘s class at Keimyung University. The class situation is pretty unique to me: 16 school teachers have taken a 6-month break off their jobs to go through a full-time teacher training program, which involves various types of language and teaching practice classes. In fact, there was no class that Friday, as in there was no class that Josette would teach and I would observe. What happened was a discussion, about English language education, Russia, Korea, me, them, students, geography, and my granny. I think I was too verbose, as I usually am as soon as I get emotional. I’d never been in a similar situation and I wish we’d had more time to share our experiences, especially theirs. My original *big as always* plan had been to write a detailed and thoughtful analysis-type post based on all my many notes (somewhat like this one). Now I think there’s a different way to do it, and also probably a better one – let the teachers of that class speak about our time spent together in their own words. So here are their/ your thoughts. My thoughts and comments will follow at the bottom of this post. It was interesting to compare the university education for major of English in Russia and in Korea. We have native professors here. And also your hard work for keeping and improving your English was very impressive and helpful for me. The reason why I attended this course was only that I wanted to improve my English that I started slowly losing. I wanted to tell you this. It’s good to meet and hear from Anna, stories from a Russian English teacher is quite new and interesting. I was surprised that her English was bad when she started university studies because I didn’t know English classes in Russian secondary school were focused on grammar, reading, and receptive skills. That happened in Korea, too. I admire her courage to quit her job and chase her freedom. I also felt I wanted to teach adults, not kids, because I wanted to communicate with students as well as teach. After hearing your words, I have empathy with you. I’m interested in your experience and your process of thinking. I was impressed with your decision and action. The most interesting thing to me is in Russia people who want to be teachers have one whole year training course in their last fifth year. 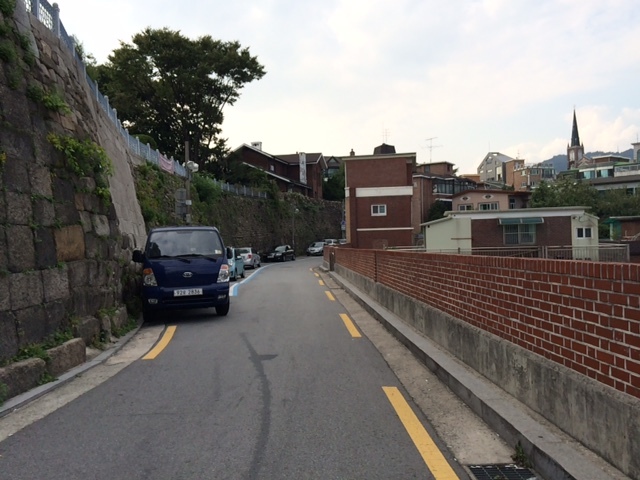 In Korea, we usually just have one month training course in our last fourth year. It was good to know the different style of English education in Russia. “Hard work helps, always..” I need to keep that in my mind to improve my English. It’s amazing again how important English is in Korea. I guess the comments the teachers shared with me on those sheets of paper are saying more than I could have said analyzing the discussion. If I am to answer the same question as they were answering, I’d say that it was significant for me to feel these teachers’ willingness to learn from whatever that was that I had to say, reflect through the lenses of their context and experience, compare but not necessarily bear judgement of either of the sides. Some things are similar, some are different. I’m very glad I’ve joined their group in BAND app and can keep in touch. I’m going to write a letter to these teachers, say what I wanted to say but didn’t have time or the right moment, share the link to this post, invite them to leave a comment. There is one crucial point I never managed to mention in our too short conversation, though, and I want to have it out here. Hard work is important. Enjoying English is kind of key, though. I sometimes might forget to say it out loud to my students and just focus on hard work (which I do believe is what moves mountains and brings progress) but… You’ve got to love it. I might be naive but I strongly believe that loving what you do (in this case, learning English) is the right way to eventually becoming good at it. 1. This post was typed using my right hand only. As have been and likely will be all of my posts. 2. This weekend I found out I’m not the only person in the world lacking the wonderful skill of typing using both hands. I’m glad Josette is that other person. If there are more of you, Right Hand Only type writers out there, please let us know in the comments below. Thank you. 3. This post is part 2 of the #livebloggingparty series. The glorious idea and plan I want to try and follow through is to meet a teacher-blogger offline, sit down in some place and blog together. Hitting “Publish” simultaneously is part of the deal. Part 1 of the series can be found here (blogging with @KateSpringcait). This post (part 2 of the series) was written sitting next to Josette on the couch in her home in Korean countryside, listening to the chirping of birds and looking at a praying mantis moving around on the window glass in what I take to be its Kung- fu fashion, scheming an attack. I am forever grateful to Josette for this chance. You can read her *excellent* post entitled Turning Points here. Final note, added here in order to be very honest with you readers: the post was finished in and published from A Twosome Place cafe area at Dongdaegu Station, Daegu, South Korea. Thanks for reading! 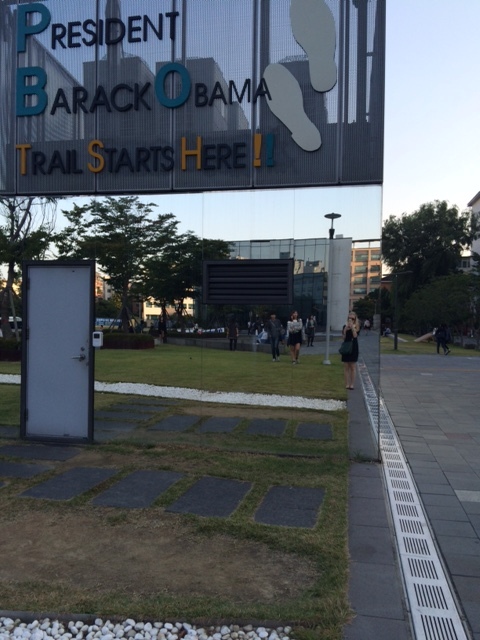 So here I am was on the campus of Hankuk University of Foreign Studies, finally taking this first step to start one of my self-imposed projects for my time in Asia. Weird as it may seem to some or many, I want to see English classrooms here and write about them. I’m ever so grateful to my friends and colleagues who agreed to welcome me in their class with no hesitation, or even invited me in by their own free will. This observation experience has nothing to do with research and I feel the need to emphasize this fact: I don’t pursue any aims other than to learn more about how other teachers hold their classes, enrich my own understanding of teaching, record my impressions in this blog, and in this way “train” myself to be more disciplined about writing. Purely selfish reasons, and here’s the exciting First Time. 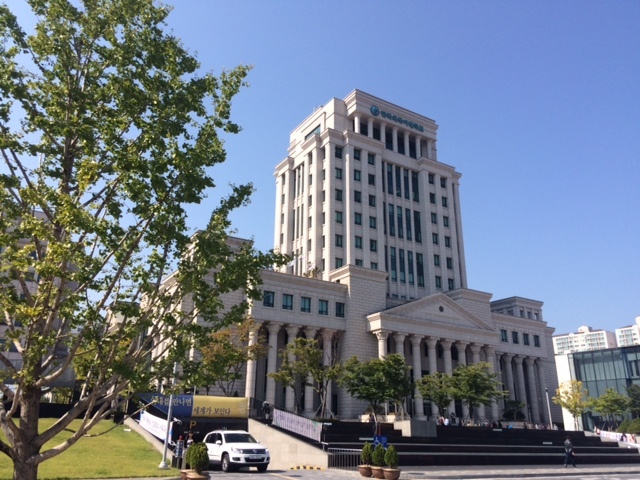 Hankuk University of Foreign Studies, Seoul. Mike Chesnut’s discussion classes. As we enter the classroom, there are already quite a few students sitting in there, maybe around 10, scattered mostly in the back seats. I pay attention that upon entering the class there’s no real greeting, on either of the parts. This strikes me as somewhat unusual to what I’m used to – and I’m sorry that I’ll keep making references and comparisons with my class as it’s about the only teaching situation I’m an “expert” of. In my practice no matter who comes into a classroom, there’d always be a “hello” and a couple of social niceties, always. This maybe is the way we recognize our presence in the shared classroom space, whether the lesson has already started or not. In any case, as soon as it’s 1 pm sharp – you can’t be mistaken, you know you’re in class. (Side note: the precision about times for class and breaks is one of the features of Mike’s teaching style I was impressed with.) I pay attention to this several times while observing: Mike is very confident, loud, clear and effective in getting his students’ attention. It’s never a compromise (like it so often is in my case), it’s the teacher’s decision and the class follows it. I’m now thinking that what I saw, picked, jotted down and labelled as interesting in the lesson flow and proceedings, in the teacher’s ways and students’ behaviour – these could be habits acquired in this certain class, for this certain class. Originally, I had a plan to turn the sketchy and often disconnected notes I was making into a similar kind of a sketchy blog post. Now that the idea of habits has emerged, I’m going to shift the focus that way. Let’s see what happens, and I know you’re kind, forgiving readers = ) I would also like to invite Mike to argue if these points are actual habits and routines or something I totally made up to qualify as such for a smoother text structure here. So this being a discussion class, there’s a discussion based on the reading they’ve done at home. The article examines a current problematic issue (Ebola). I realize my perception of this class is bound to be influenced by my own experience seeing students work – and, well, I’m impressed to say the least. The 20 students here in this room are actually discussing the article and following the given tasks – and speaking English all the way. This is impressive. I know now these students are English majors and nearing graduation, and still I’m in deep appreciation of their language command, willingless to communicate solely in a foreign language. Apparently, the majority of them have interesting backgrounds which would account for their competence, and to know more about those wold be exciting, too. If you’ve read my posts before, you might know I get bored too fast and too easily, so I always need to change activity types, whether I’m learning or teaching. In this class, the discussion of the first 2 paragraphs of the article lasts for almost 25 mins, and when I look at my watch and note this time, it is still going on actively. To me personally, this is spectacular and deserves praise. Throughout the whole 2 hours I notice only one pair of students who seem to be sort of left out of the conversation, uninterested or having trouble with language/ ideas, I can’t know the reason, but otherwise I don’t see anyone visibly lagging behind. Anyway, most surprising to me was the total lack of Korean in class among students. Even when I heard they got sidetracked from the task in their conversation, they still continued the “social” chat in English. But was it really non-stop? In fact, as soon as Mike told them to make groups for brainstorming topics for their midterm exam, all students automatically switched into Korean. I walked around and peeked into their list of topics and notes – many of those were in Korean, too. I stayed for half of Mike’s second class that afternoon, and that group were speaking tangibly less English among themselves and significantly more Korean, logically. I don’t want to jump ahead and make conclusions about students I don’t know and connect it with their culture, but it could be seen quite distinctly that that particular group were very well aware of the class proceedings, of its requirements and routines. Getting them arrange themselves in groups, assigning the tasks was done in passing, very quickly and casually but nonetheless causing no fuss about it. Hence is my thinking that this is the typical organization of classtime – getting into small groups, comparing summaries of the article, working through the paragraphs in detail. Meanwhile, Mike moved around and helped the groups with more questions or comments related to the points students were talking about, or sometimes with any language issues that arose (like helping them to shape their English into academic discourse type by providing better, more suitable vocabulary). Mike mentioned that groups of 2 students are best, of 3 – ok and of 4 – getting a bit too much. Among about 20 students present in that class only 6 students arranged their group work space in such a way so that they were facing each other, by moving their desks. I found this interesting. I’m not sure how/if this fact impacted the quality of their discussion, but in my personal opinion (1) groups of 3 are potentially more productive; (2) talking to people as you’re facing them and can use the space around you freely is more natural. When I go to a cafe to talk with a friend, 100% of time we’ll take seats opposite each other. Being a stiff and rigid Russian that I am, I pay more and more attention these days to how other teachers/ presenters use their body language and facial expressions to help drive their message home. Mike uses interesting gestures to make the point sink in. It gets especially clear when he’s trying to draw attention, for example to their upcoming (very easy!) vocabulary quiz. His gestures mimic and reinforce the intonation pattern of his speech, and it was really exciting to watch how his sentence stress pattern is reflected in gesticulation (especially the “hand hammering” type when the moment gets emotionally intense and important). I’m making a note here for myself to keep it in mind for watching other teachers in their classes. When I get a chance to see a Russian teacher “in action”, that’d certainly be even more exciting to see if there’s any similarity re this aspect at all. I’d guess not, but that’s an assumption tied to a stereotype and/or based on my own experience. The reason this caught my eye is solely related to the way I teach my classes. What Mike is doing is mostly bringing students’ attention to language issues and inviting them to “look up, play with the words and phrases”, and then be ready to use those in their exam. With full realization that a discussion class is not exactly the same thing as a language class, I still wonder. I wonder what’s with the students who will keep making mistakes (say, using “even though” incorrectly) in their discussion groups. I wonder if a teacher in a discussion class would know OR needs to know, let alone do something about it. I’m again reminded of self-discipline and general tendency towards self-organization of studies here in this particular teaching situation. At the same time, it’s my perception that the teacher does a lot of work for the students. Finding the language and putting it in the slides, coming up with discussion questions, then uploading all those into their e-class system – everything’s ready for students to use. We don’t know, or don’t care to know, what’s in their personal notes, unless they ask – and they so rarely did! In fact, the open class interaction took place about 3 times in 2 hours, within the space of 7-10 minutes. There was one language-related question to Mike from a girl (seeking clarity in the difference between “pandemic” and “endemic”), followed by a subsequent comment from another girl, and one more question from a boy looking for an antonym. That was pretty much it, no eliciting or checking back. All the speaking/ interaction the students did was in their groups, talking over the issues they were instructed to discuss in the slides. When the time alloted for a task was over, Mike brought the class’ attention to himself with a loud clap – and he just started saying what he needed to say. It is/ was amazing for me, as I struggle with interrupting people a lot, in my class and in my life. So the teacher went through the questions himself, giving answers, supplying comments, all very quick and clear. He ran through the language he’d picked out from those paragraphs, giving his own examples of how to use this or that phrase. The language focus (?) never took more than 5 minutes, there was a lot of nodding from the students, but otherwise it’s always Mike talking and instructing…. As opposed to my class that I teach at university. Again, mine is surely different by definition, being more of a genuinely language class, but there’s massive “nursing” I’m doing all the time. Overall impression about the class is this: brisk teaching manner, energetic, always to the point, very smooth and even in pace. There’s no wasting time. The teacher is clearly in control of time and tasks ahead. You might know that one of my regular curiosities and doubts is just how much of the teacher should there be in a lesson. Well, I had a feeling that there’s just the right amount of Mike in his class, even with his unusual (for me) interaction style. Somehow he divides the time into portions when he organically blends with the class, joining groups and their discussions, and then comes to the front and becomes the Instructor. The former portions are significantly prevailing time-wise! 1) As I’m not using PowerPoints to teach my class (basically for the reason of having no technology to demonstrate it)), I pay attention to how it’s used. The task is typed on the slide, and I find it both useful (for the teacher and students – saving time, handy for reviewing the material) and also possibly stripping the class of teacher-student interaction. This feeling is haunting me through the whole of classtime – just how much do the Instructor and the Instructed actually get into contact? Another thing regarding PowerPoint is the way Mike types “Ask your instructor” in there – it’s not “me” or “Michael” or any other suitable but more personalized address. 3) No “Bless you!” for the person sneezing. This is the second time I’ve noticed it, the first being in one of the workshops at KOTESOL. Is it a thing to not say “Bless you”? 4) 9 people in that discussion class were wearing glasses (10 with Mike). I just thought I’d count something, as Scott Thornbury suggested during his presentation at KOTESOL (read a nice review of it here on David Harbinson’s blog or here on Tim Hampson’s blog that I’ve just found myself). 5) One student, quite casually (without even looking at me! ), said “Добрый день” (dobry den’ – good afternoon in Russian) to me when passing by on the stairs. I am so obviously Russian-looking, and Hankuk University of Foreign Studies is indeed about languages. During our great time chatting after the classes Mike asked me what was one thing I would change in his class. I failed to give an articulate answer then and said I hadn’t been focused on looking out for such a thing during classtime – I was simply doing the noticing and trying to be descriptive of what I was seeing. But then later I thought of something. The classroom looked rather spacious to me, with desks and chairs light enough to be carried around and arranged in a different manner. I’m wondering now if making students stand up and move around as part of their discussion tasks could be seen fit. It might reflect my personal issue of having trouble sitting in the same position for a long time, no matter how interesting the conversation is… I would probably make them do part of task standing, or find another way to “fill” the unoccupied classroom space. In fairness, it’s my personal resolution for every single new term to encourage more moving around in class, for various reasons. And for the only reason of being too set and rigid in my teaching ways, I fail it every single new term. Big thanks to Michael Chesnut for his trust and hospitality!